The Tahiti Pro is one of only two events where some surfers have a clear advantage over others. A good day on the tools, a little luck in the draw, and any surfer in the Top 32 can win Snapper, Bells, or France. But Chopes and its sister event at Pipe demand native skills. Rare skills. Rare even among the best surfers in the world. But for the advantage to apply the ocean has to deliver. The waves have to expose their brutal nature. It’s why Filipe Toledo has spent the last two weeks at Teahupoo. He’s got a tidy lead in the rankings - 4,000 points over J’Dub in second, 10,000 over Gabs in third - yet Filipe ain’t a natural Chopes surfer. Big backside barrels over live coral ain’t his thing. Other surfers have an advantage over him. Fortunately for Fil, the advantage is likely to be nullified this contest with Teahupoo unlikely to show its true nature. 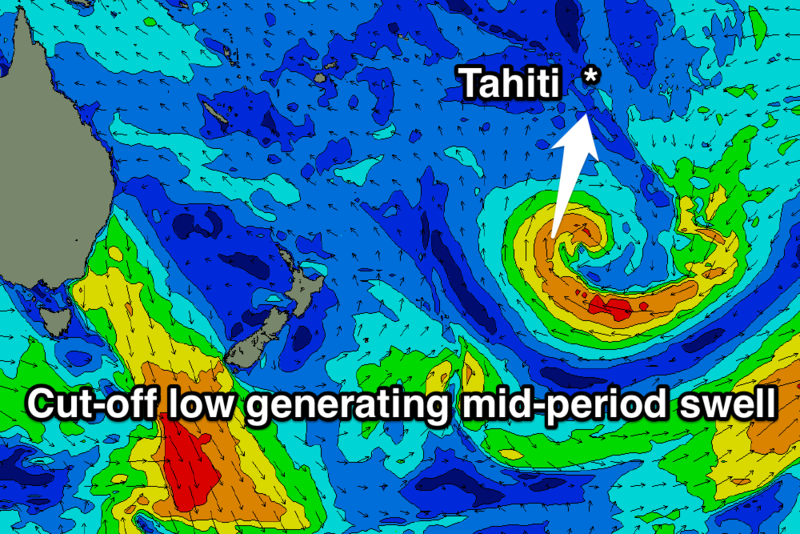 Teahupoo's prime swell window is just off New Zealand's East Coast and the ideal set up leading into the Tahiti Pro would see a node of the Long Wave Trough positioned just east of NZ so polar storms track up the corridor towards Tahiti. Unfortunately this is not the set up we’ll see during the contest, which starts this Friday. 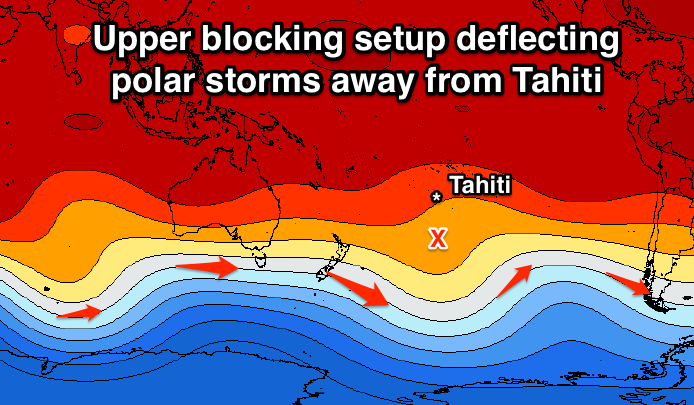 In fact, we'll see the opposite of the ideal arrangement, with a blocking high steering storms to the south and away from Tahiti. The large blocking surface high is forecast to develop a few days before the first day of the waiting period, remaining stationary as a couple of tropical depressions squeeze its northern flank. There will, however, be a solid swell for the surfers to warm up in. The swell formed two days ago before the high slipped into place, and it’ll provide a day of waves up to 8ft from a southerly direction under ideal NE winds. It’s forecast to be bigger than anything that’ll hit during the waiting period. The first two days of the waiting period - Friday and Saturday local time, Saturday and Sunday Oz time - will be very small with S and SW swells breaking under variable winds from the S through to N.
The tricky winds are due to a passing cut-off low. With large storms being blocked, the organisers will have to watch the passage of theses small cut-off lows as they could provide fleeting periods of mid-period waves. Sunday - all local time from here on - will see the first of these strike Teahupoo with the size wavering between 3-5ft, biggest in the afternoon. Trades will be blowing. This size will continue on Monday, same wind conditions too. Late Monday will see another mid-range swell will hit with slightly more gusto - expect waves closer to 6ft as it builds through Tuesday. However, the increased size is due to the proximity of the storm and it’ll also mess with local winds - there’ll be periods of unfavourable SW winds through the day. It won’t be pretty. By Wednesday the wind will slide back toward the classic trade direction, yet the wave size will also taper off. There may be the odd 5ft set but the energy will be lacking - 3-4ft is a better call. Thursday begins a stretch of unfavourable mid-period SE swell, topped up by very distant - hence inconsistent - long-range SW swell. We’ll peg all those day at 3-4ft but as they’re over a week out they’re open to changes. We’ll revisit them in the notes below. Whatever changes do come in it's safe to say this isn't gonna be a big Chopes year. How's this shot of Michel recently in Tahiti by Ben Thouard.. incredible! 4th or 5th year in a row of no swell. Amazing wave and still great when small but is it time to ask the question...is it too fickle for the tour? Personally I think it's more watchable when it's smaller. When it's 6-8ft it's too predictable - take off, grab rail, stand tall. Nothing else they can do. When it's smaller there's a lot more room for turns, floaters and threading the odd drainer. Gab will tear it to shreds, Julian defending champ will be the hot fav? Hey Stu/Ben, have the last couple of months been unusually bad for these large blocking highs? It seems they moved into place over eastern Australia early winter and have just been coming one after the other? It’s all northerlies and springtime flowers in early August , do you think the lows will push up one last time or is it curtains already? Yeah, the current run would be linked to the negative SAM signal as well as node of the Long Wave Trough being focussed over WA, keeping the storm track too north and across the country. This isn't great for swell producing systems off the East Coast. Trails are streaming right now. If anyone is interested. (french only ). NEWS: Kelly pulls out of Tahiti pro Mikey gets a free ride. Italo pulled out of US Open QS semis but apparently is good to go. There's been no change to the surf outlook with a poor mid-period swell from this guy. Any new swells for forecast period ?